A result of the new hobby that was emerging based on the on-going competition with Topps, 1954 Bowman Baseball was ultimately a frugal attempt to regain market share while cutting costs. 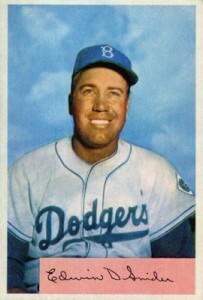 Although the endeavor did not yield much for Bowman, the set still has a lot to offer collectors. By 1954, the battle between Topps and Bowman for the hearts and minds (and pocket change) of American kids was still in full force. 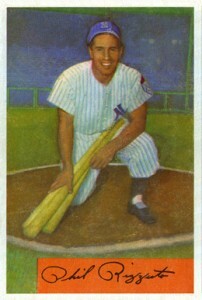 The collateral damage from that fight was seen in some of the cards from the 1954 Bowman Baseball set. Not only were several cards corrected for errors after being rushed so quickly into production, but one ended up being withdrawn altogether and replaced. 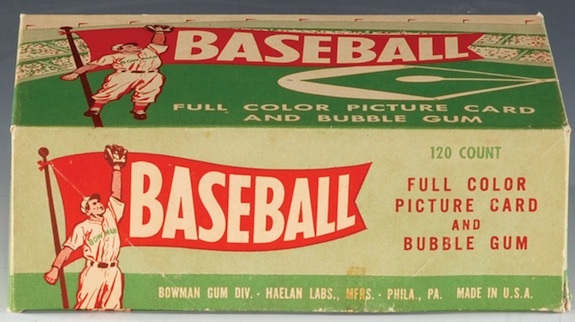 The 1954 Bowman Baseball set contains 224 cards. However, an estimated 40 variation cards are said to exist, bringing the total card count for the set builder to 264 cards. Printed and distributed in two series, cards #1-128 make up the first group and #129-224 comprise the second series. Unusual for the era, the high-number series is not all that much more difficult to find than the low-number series. Measuring 2-1/2" by 3-3/4", the 1954 Bowman Baseball card fronts consist of a player portrait, though not nearly as rich in color as the company's 1953 baseball card set. 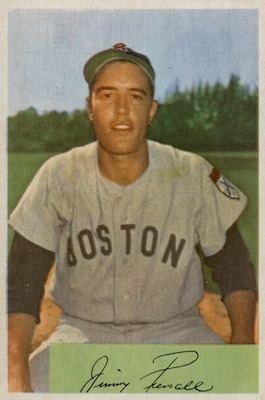 A small pastel-colored box in a lower corner contains the player's signature (or block print, for certain late-series cards), while a white border surrounds the picture and box. 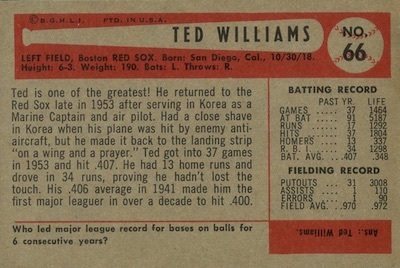 1954 Bowman Baseball card backs include a bat and ball graphic, with the card number located inside the ball and the player's name in the bat. A few vital statistics and a short biography follow. Also featured on the backs, a trivia question is found along the bottom and a small box to the right contains the player's 1953 stats. The answer to the trivia question is located below the stat box. The set utilizes a unique numbering system that rotates between all sixteen teams, so each team has a consistent pattern. 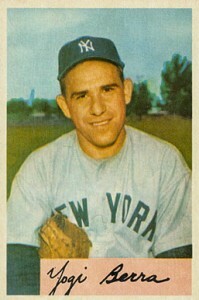 For instance, the Yankees are found on cards #1, 17, 33, 49, 65, 81, 97, 113, 129, 145, 161, 177, 193 and 209. The Red Sox follow with cards #2, 18, 34, 50, and so on. Each team has 14 cards unless you include both #66 cards, which makes 15 for the Red Sox. 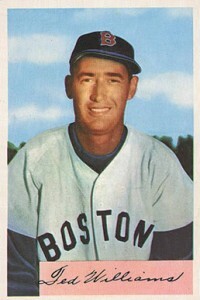 The most valuable card in the set is Ted Williams. However, the high values are not simply because he was one of the biggest players in the game at the time. 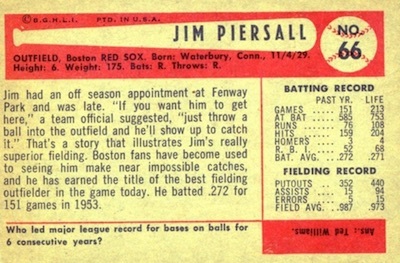 Topps managed to sign him to an exclusive contract in 1954, so Bowman had to pull card #66 and replace him with teammate Jimmy Piersall. This extreme scarcity results in huge values, but most collectors consider the set complete with the #66 Piersall in place of the Williams card. Despite the loss of Ted Williams, there are several stars in the 1954 Bowman set that cannot be found in the Topps set of the same year, including Mickey Mantle, Bob Feller, Roy Campanella, Robin Roberts and Pee Wee Reese. Unfortunately for the set, there are very few notable rookie cards. Top options include Don Larsen and Harvey Keunn, which is made even more disappointing considering the rookie cards found in 1954 Topps. 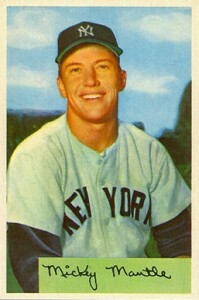 One oddity of note is the cards of Baltimore Orioles players. Their fans may be either amused or infuriated by the cards Bowman printed. 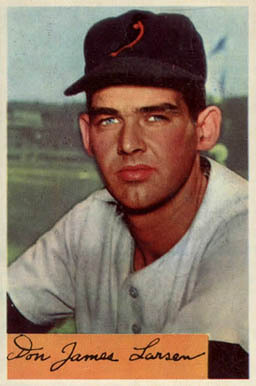 1954 was the team's first season in Baltimore after playing as the St. Louis Browns since 1901. The move was announced and the new team name and logo had been unveiled, but there were no pictures of any of the Orioles in their new uniforms. Bowman's art department had to make do with their best guesses, which resulted in having the bird looking the wrong way on some caps. 1954 BOWMAN ENOS SLAUGHTER PSA 9 (MC) MINT !! Great Hall of Fame stars! 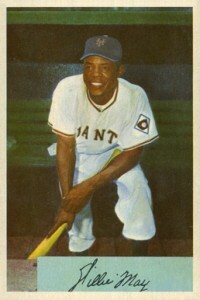 Interesting pictures of players and many hard to get cards–centering is a particular problem! 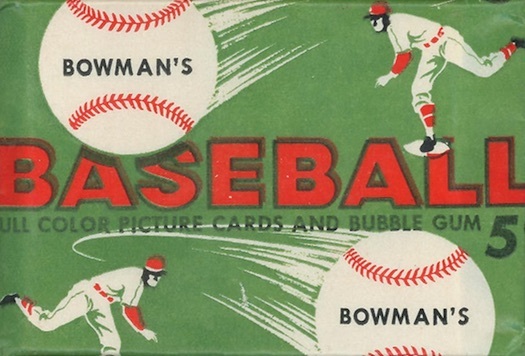 The 1954 Bowman set is one of the easier sets of the 1950’s to complete, with no high number series (like in the other Bowman or Topps sets from the 1950’s and 1960’s) to go after. It was not a particularly difficult set to complete. Apart from the Ted Williams card (#66), which I don’t have, the 2 most expensive cards from this set were Mantle and Mays. Fortunately, I completed the basic 1954 Bowman set (with #66 Piersall) in the mid-1980’s, at a time when old baseball cards were a lot cheaper back then. It is a very nice set.